Most of my published work falls into this category. Some of these books are solo projects, others are collaborations with others. The people who also worked on these books are professionals like me; i.e. they actually delivered what they said they would. I did pick up some bits and pieces from those that ‘flaked’ from time to time. I’m not claiming that I was the sole writer on all of these titles; in many cases there were up to four others involved. So if you see someone else claiming these books as theirs, neither of us is wrong. Inaccurate as it may be to refer to the Norse people as 'Vikings', the term is commonly recognised so we went with it. This book deals with a lot more than just the 'Vikings' (ie those who were engaged in an expedition at any given time); it also covers Norse mythology, Norse society and the history of the Norse people in general, including their brief and rather ill-fated foray into North America. This is my second book about drones (more accurately, UAVs and ROVs as well as what are commonly called 'drones'). The first was a children's title which won an award for excellence in science and technology writing. This is a more adult treatment of the same subject, in greater depth and covering wider issues as well as the many miltiary and non-military UAVs available today. The 'Wars of the Roses' era was a turbulent time for England, with repercussions felt across the Continent. Arguably, the outcome of what started as a fairly typical dynastic struggle laid the foundations for some of the most fundamental changes to occur in the nation's history. Without these events there might have been no Church of England, no Dissolution of the Monasteries (whose consequences may have led to the proliferation of distilling across what is now the UK) and a very different Renaissance in England. I’m a contributor rather than the main author on this project. Essentially the publisher wanted an updated edition and the original author was not available, so they contracted me to write slot-in sections. Which, by the way, is a lot harder than it sounds. A similar (but different) volume for another client, this volume is divided by conflicts and regions, with a lot more textual facts (but thus less pictures) about the weapons used in various mid 20th-century and later conflicts. It would not be unreasonable to think of the Visual Encyclopaedia as a catalogue. This is a more in-depth look at the major weapons used in conflicts since 1945. The ‘Battles’ books were a collaborative effort, where several authors each wrote up several battles for compilation into a final volume. Typically 4-6 authors worked on each title, but the distribution of effort was not even. In general, whoever finished the first round earliest (usually me) got the unassigned battles… where were often the hardest to write and thus not grabbed in the first round. Most but not all of these books are in the same series and have a similar look; a couple were for other clients but based on coincidentally similar concepts. When this one came out, I’d forgotten I’d written for it. I spotted it and had a look to see who the publisher was, because it looked like something I might work on. Guess I was right about that; I wrote some of the entries. 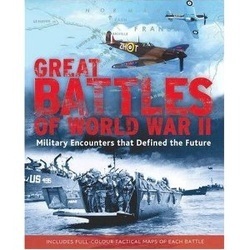 The book itself does what the title suggests – it gives accounts of some of the most important engagements of WWII. Battles That Changed Warfare gives accounts of engagements were a new tactic, system or weapon came to the fore, and how it influenced both the course of the action and the future of warfare. From early chariot warfare to stealth technology, this volume is all about the moments in history where warfare was changed. In many cases the weapon or concept had been in existence for some time, but it was only in the crucible of battle that it was vindicated. Battles of the Bible is, to a great extent, the book that got me involved in TV. It’s all about the earliest organised warfare, with accounts pieced together from carvings, historical records and of course religious books. Material covered ranges from early tribal warfare to the great conflicts against the Assyrian and Roman Empires. As the title might suggest, Battles of the American Civil War deals with the main engagements of the War Between The States. This was an era in which new military technologies were beginning to make their presence felt on the battlefield, and the traditional, ‘Napoleonic’ style of warmaking was beginning to give way to a modern system. The Crusades pitted the feudal armies of Europe, the highly organised forces of the Muslim world and the decaying might of Byzantium against one another, in an era when early gunpowder weapons were beginning to emerge. This volume focuses on the main engagements of the crusades and their influence on wider events. Battles of the medieval world covers the mediaeval period, as the name suggests. Warfare in this era was far more complex than the ‘knights bashing at one another’ image popularly portrayed. Strategically important raids and scientific sieges were far more common than open battle, but when great battles occurred they often had far-reaching consequences. Battles of the Ancient World deals with conflict prior to the medieval period, including ancient Egypt, Greece, Persia and Rome. All of these powers had complex military systems optimised for a certain kind of warfare, and were forced to adapt to new challenges as they emerged. The so-called ‘barbarians’ of the era were also in many cases more subtle and adept than they are given credit for. This volume covers the clashes of these great powers and the subsequent development of military science. The 7-View series presents technical data and other facts about the subject along with views from seven dfferent perspectives. World’s Worst Weapons covers a wide range of personal and military weapon systems and projects that should have led to workable weapon systems but, for whatever reason, did not. Most of the weapons included are just plain bad, but some are actually world-beaters despite having characteristics that perhaps should have consigned them to an early retirement. Others are a bit of both, such as the Tiger tank. Individually awesome, the Tiger was a fuel-hungry white elephant. It absorbed resources that might have better been spent on war-winning workhorses. It won battles, but it also helped contribute to the downfall of the Third Reich. A comprehensive guide to the major air-launched weapon systems used today, along with a historical perspective and a detailed examination of the missions carried out by combat aircraft. 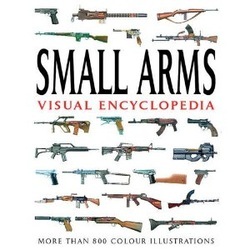 Small Arms was my first book for Amber Books. 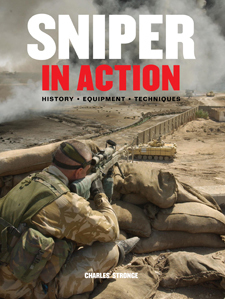 As the name suggests it’s an examination of the development of personal and military weapons over the past 150 years or so, from cap-and-ball revolvers to the new generation of Personal Defence Weapons. As the title suggests, this one is all about armoured fighting vehicles and how they compare to others of their generation. The book covers the entire history of armoured combat from the First World War onwards, and includes head-to-head comparisons of highly influential tanks from each period.